Need to receive a fax? No fax machine and no telephone handy? 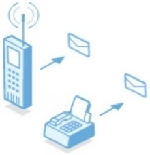 Receive fax documents directly into your e-mail ! With U800 Fax to E-mail, you won't miss that important fax. When your U800 toll-free number receives a Fax, our system automatically converts your message into an image and instantly delivers it as email directly to your email address. It's really as easy as receiving an e-mail message. For your fax convenience, you can choose between popular TIF or PDF(Acrobat) image filetypes for quick viewing of your received documents.